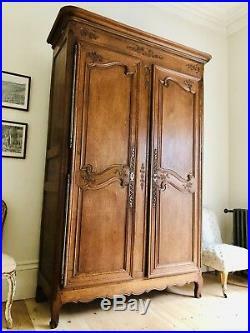 Stunning Antique French Solid Oak Wedding Armoire/Linen Press. 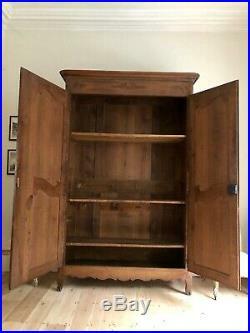 It dates from the 1800s and comes from Normandy. 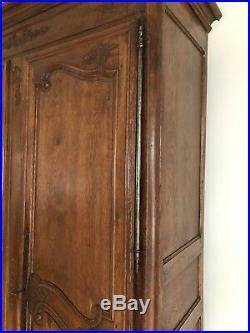 It has beautiful hand carved detail to the solid oak doors, top and feet. It has lovely carved panelled sides. It has its original heavy long iron hinges, escutcheons and large key. It has been waxed and polished ready for sale and is in fantastic condition. Dimensions height 227cm x width 147cm x depth 60cm. Depth without top piece 54.5cm. It has 3 internal shelves, however a brass hanging rail can replace the two bottom shelves if preferred. It would be professionally fitted and sit beneath the top shelf. The doors and top piece can removed for transportation. Alternatively collection and viewing from Hove, East Sussex welcome. 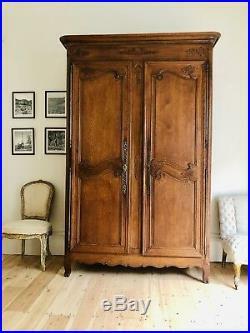 The item "Antique French Oak 19th Century Armoire Wardrobe Linen Press Super Condition" is in sale since Friday, February 15, 2019. 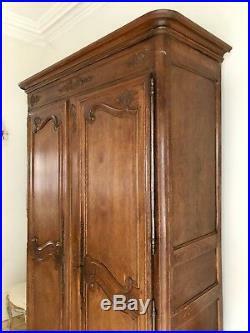 This item is in the category "Antiques\Antique Furniture\Armoires/Wardrobes\Pre-Victorian (Pre-1837)". 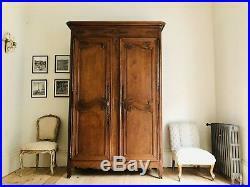 The seller is "joanne5095" and is located in Hove.